Well I finally landed in Thesaloniki, Greece. I have been reunited with my Greek brother, Yiorgos and we plan to take this country by storm once the crazy German gets here. We're currently waiting on him at the airport. So far we've been to the mall and had some Haagen Dazs and a few espresso's. I'm past the 25 hour mark with sleep and don't foresee me getting sleep anytime soon. I see it as a good opportunity for ultra training, others might argue the health ramifications though. And, yes, I bought a bottle of Johnny Walker on the plane (doody free); we're going to have a taste test session later tonight back at Yiorgos house. Volli is in route from Bucharest right now. We just discovered that his flight was delayed so Yiorgos and I are taking advantage of the free wifi here at the airport. 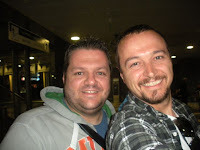 Yiorgos is watching sporting events on his iPhone and I'm (of couse) blogging. Dorks. 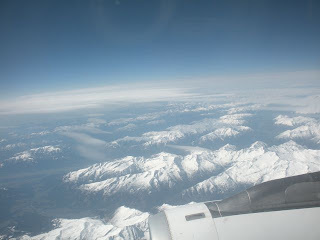 Here is a cool picture that I took of the Alps on my flight from Munich to Greece. 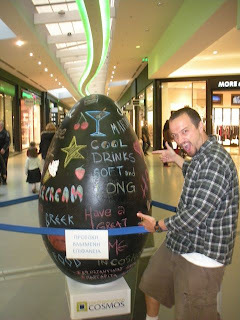 Oh and here is a big egg that I found in the middle of the mall in Thessaloniki. I can't believe nobody else saw it and put it in their basket... I got it!